A dance which is famous all over the world has now found admirers in Moscow. 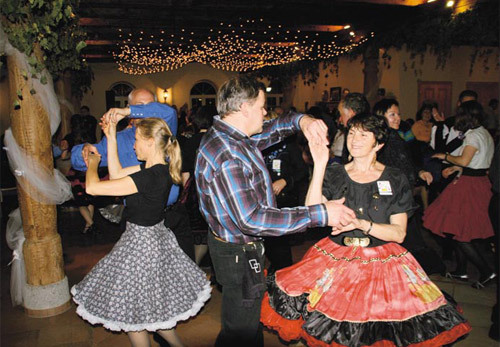 There are more than 500 Square Dance clubs in Germany, but in Russia there are only 4! For some, Square Dancing is just hoping around, for others it is running around wild. But much more than this: Square Dancing is fine exercise for the body and mind. And it is balsam for the soul amidst the stresses of today. Square Dancing is a modern dance that fulfils all requirements to promote and maintain all-round-health for all ages. Believe it or not, Square Dancing works for dancers as well as for non-dancers, for dance fanatics as well as for left foot charlies. The start of today’s modern Square Dance can be traced a long way back. From the Morris dances, from French aristocratic dance, German landler, the Polka from Poland, waltzes from Austria, and Scottish, Irish and English folk dances. In Square Dancing, people developed a new dance form in which the character of its heritage is clearly recognized even today. During dance lessons you will learn new routines which are performed by the dancers in different variations. The dance scheme doesn’t exist in advance, every time there is a new variation. This dance doesn’t belong to any type of competition, people Square Dance for pleasure and pleasure alone. Four couples, one on each side, build a square. This is the starting formation and it gives the dance the name: Square Dance. More dynamism was achieved later, a puzzle game was developed by the caller, leading the dancers through various formations and astonishing the dancers by adroitly restoring the starting formation: the square. New programs were developed and their world wide acceptance is guaranteed, so that someone can dance all over the world, once he/she has learned the basic routines. With or without a partner, everyone is welcomed into a circle of friends and everyone is greeted with friendship. There is no hierarchy, and titles are left at home. There is no competition, only the fun of being together with music and dance. Square Dancers visit each other at each other’s club nights and organize regional, national and international dances functions. At the annual jamborees of the Club and Caller Associations between 1000 and 2000 dancers get together for a weekend. World War II prevented the development of this kind of dance, and in 1950 Square Dance started growing again. Americans soldiers transferred the dance back to its European backgrounds, and in 1955, the European Association of American Square Dancing Clubs (EAASDC) was formed. EAASDC is an association for the Square Dancing, Round Dancing and Clogging dance clubs within central Europe. The countries covered so far are Germany, the Netherlands, Belgium, Switzerland, Austria, Italy, Spain, the Czech Republic and Russia.